Smartphone rivals HTC and Samsung have both chimed in on Apple's antenna attenuation claims made last week, with both companies suggesting their handsets do not lose signal when held improperly. As reported by The Wall Street Journal, HTC said on Monday that reception problems are not common on smartphones, regardless of what Apple said at its iPhone 4 press conference on Friday. HTC suggested that Apple should fix its own phone rather than bring competitors into the fray. "The reception problems are certainly not common among smartphones," the company's chief financial officer, Hui-Meng Cheng, said. "They apparently didn't give operators enough time to test the phone." But John Gruber of Daring Fireball also pointed out on Monday a screenshot from HTC's instruction manual for the Droid Eris. 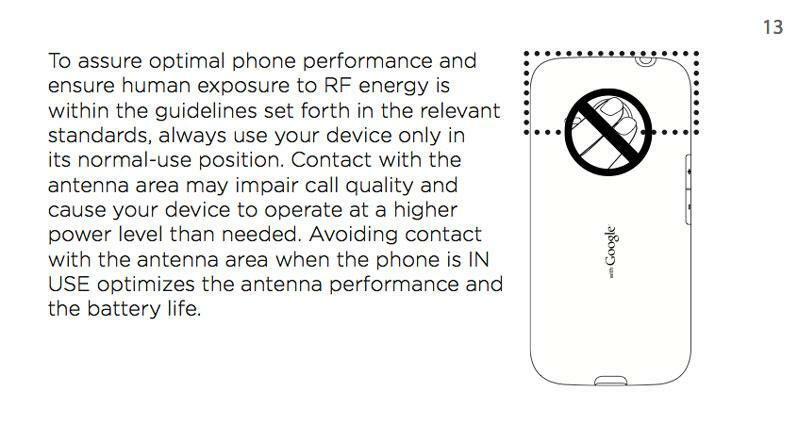 Page 13 includes an illustration of the Droid Eris, showing the portion of the phone where the antenna is located, and instructing users not to touch there. "Avoiding contact with the antenna area when the phone is IN USE optimizes the antenna performance and the battery life," the manual reads. In addition, Samsung also gave comment on Apple's claims, as the Cupertino, Calif., company specifically cited the Omnia II smartphone in a video showing signal attenuation. The company simply noted that it "hasn't received significant customer feedbacks on any signal reduction issue for the Omnia II." The comments come after both Nokia and Research in Motion also issued official statements disputing Apple's statements from its press conference. RIM said the company's approach was an "attempt to draw RIM into Apple's self-made debacle," while Nokia did not specifically mention Apple, and instead called itself "the pioneer in internal antennas." Since the iPhone 4 was launched and users discovered they could lose reception by holding it in the bottom left corner, Apple has maintained that any mobile phone experiences reception issues when held improperly. The company, on Friday, said it will address customer concerns with the iPhone 4 by giving away free cases for every customer through Sept. 30.